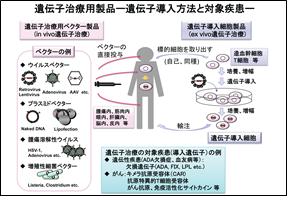 Recent progress in life sciences, especially in genome research and biotechnology, provide new approaches to innovative therapeutics such as gene therapy products, oligonucleotide therapeutics and molecular target drugs, and gene diagnostics. In this division, we are engaged in the studies on the evaluation of the quality, safety and efficacy of the innovative therapeutics. 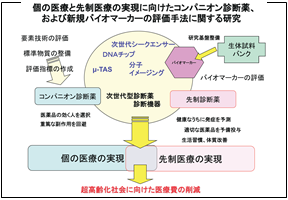 Biochemical and molecular biological studies related to those products are also conducted. 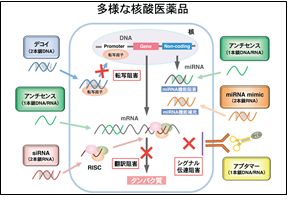 Various gene therapy products and gene tranefer methods are used for gene therapy. 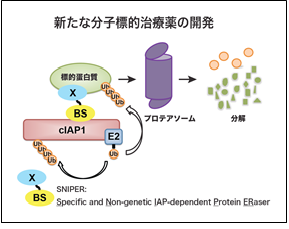 We developed a series of small molecules named SNIPER, which induces target protein degradation via the ubiquitin-proteasome system.